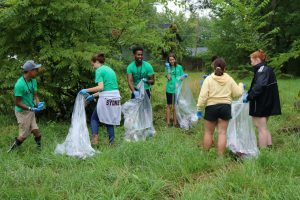 Students from Warsaw, Ind., picked up trash in a vacant lot. “I don’t like doing yard work, but it’s not me doing this. It’s God,” said Andrew as he pulled weeds in downtown Marion, Ind. 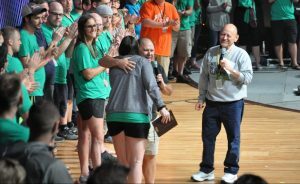 He was part of a team from Norwalk, Calif., and students from Momentum Youth Conference who had spread across north central Indiana on Saturday to perform acts of service at approximately 60 different sites. “I want to show the love of Christ to the community by doing small things,” added Megan, also from California. In the Hope neighborhood, Rose Pope, past president of the neighborhood association watched with appreciation as a group of young men from Akron, Ohio, picked up trash around the working class community. “There is more trash being accumulated by the residents,” she noted. The rainy day made weeding in downtown Marion much easier. Josh was also picking up trash on the same quiet street. He called it a “private discipline,” helping others when no one else sees it. “While no one is looking, God is,” echoed his friend, Dillon. A few blocks away, a group picked up trash on a vacant lot. “It’s a great way to show Christ throughout the community,” said Audrey, from Warsaw, Ind. “It’s not my community, but it’s a community,” she added as she enthusiastically waved at a car, hoping it would stop so she could pray with its occupants. Lee Seese, Johnstown, Pa., was recognized with the Faithfulness Award. Leah Alderfer, Gulfview Grace Brethren Church, Port Richey, Fla., was recognized as the Youth Sponsor of the Year. Timothy (TK) Kurtanek congratulates her, while Ed Lewis looks on. The Momentum students fanned out in a 150-mile radius from the Marion, Ind., campus of Indiana Wesleyan University, where the conference is being held. 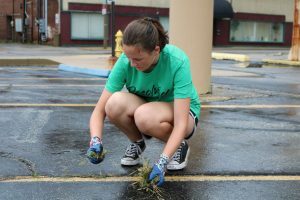 While the rain canceled some activities, students still helped with trash pick-up, painting, chopping wood, and other acts of service from as far north as Warsaw and Winona Lake, Ind., to as far south as downtown Indianapolis. 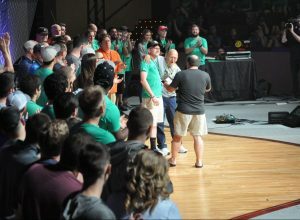 Youth Pastor of the Year — Cody Ray, Connection Christian Church, York, Pa. Youth Sponsor of the Year — Leah Alderfer, Gulfview Grace Brethren Church, Port Richey, Fla.
Faithfulness Award — Lee Seese, Johnstown, Pa.